Alright, you caught me again. It’s not the birthday of the beer style, Porter. Strictly speaking, this isn’t really a beer post but it’s my son’s 17th birthday today, but since his name is Porter I figured people wouldn’t feel too duped by the title. It is accurate, after all. 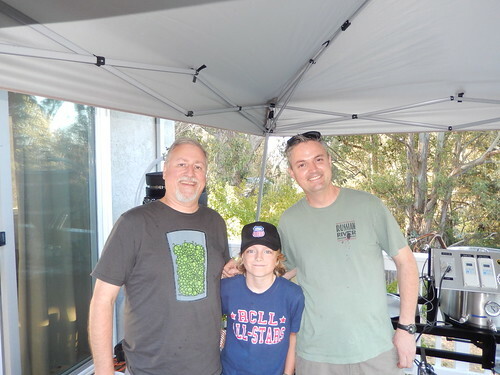 In previous years, I’d written that “one day soon, we’ll brew a porter together.” Well that day finally came, and five years ago on his birthday weekend it was Porter’s Porter Day, when he made his first batch of homebrew, with a little help from our friends. Anyway, please join me in wishing Porter a very happy birthday! 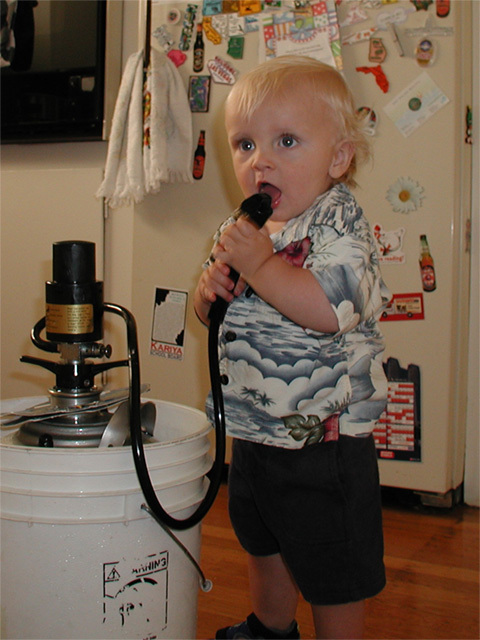 At Porter’s birthday party when he turned one, trying to get at a keg of Russian River. That’s my boy! NOTE: To those of you reaching for the phone to call child protective services, put down the receiver. He did NOT drink any beer. His mother got to him before he figured out how the tap worked. A beautiful memory at the Rogue Alehouse in San Francisco when Porter couldn’t have been more than two, if that. 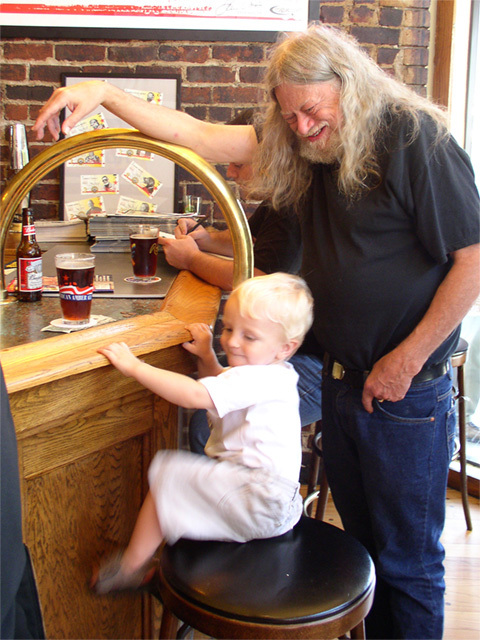 Much to my surprise, Porter utterly charmed Don Younger with his ability to swiftly climb a bar stool. 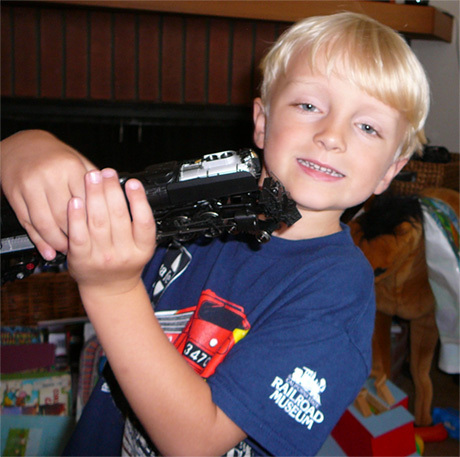 Don was very impressed, and so was I.
Twelve years ago, showing off a 5th-birthday present from Grandpa, a Union Pacific Challenger steam engine. 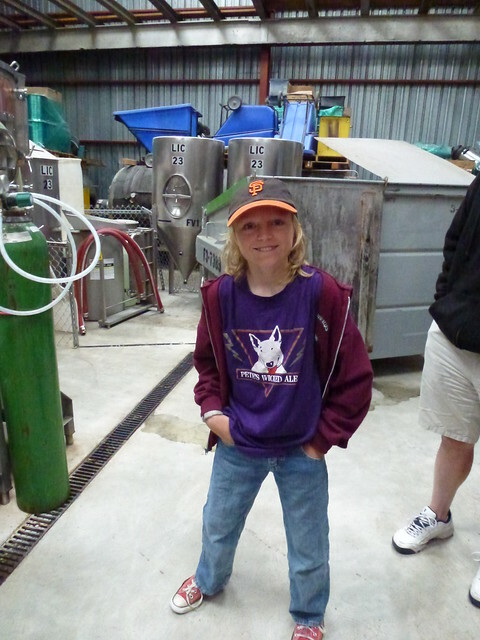 Porter several years ago, when he came with me to visit Southern Pacific Brewing in San Francisco. He was trying to emulate his then-hero Tim Lincecum, at least hair-wise, pitching-wise he was more of a closer. Timmy may be gone, but the hair remains. Me, Porter and Vinnie Cilurzo, after Porter’s Porter Day five years ago. 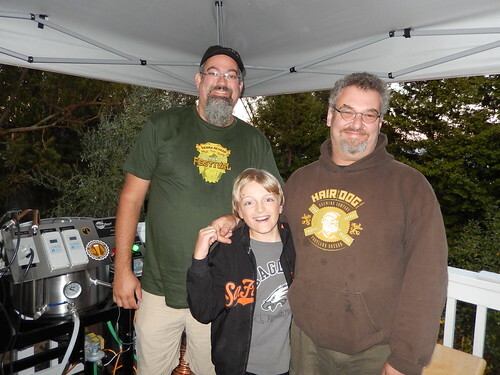 Also four years ago, Porter’s second batch, a version of Hair of the Dog’s Doggie Claws, made with the Homebrew Chef Sean Paxton, but mostly Alan Sprints, whose own birthday was just a few days ago. 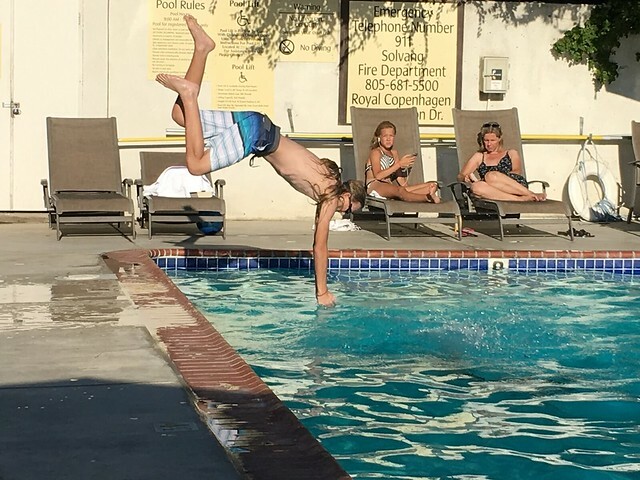 Wowing the ladies with his diving prowess during a vacation in Solvang last summer. 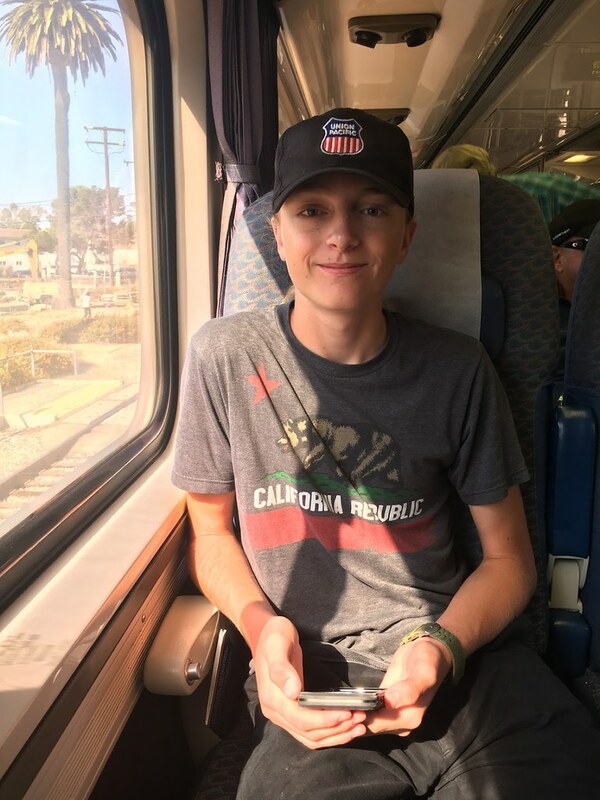 Porter riding Amtrak, also during our summer vacation last year. 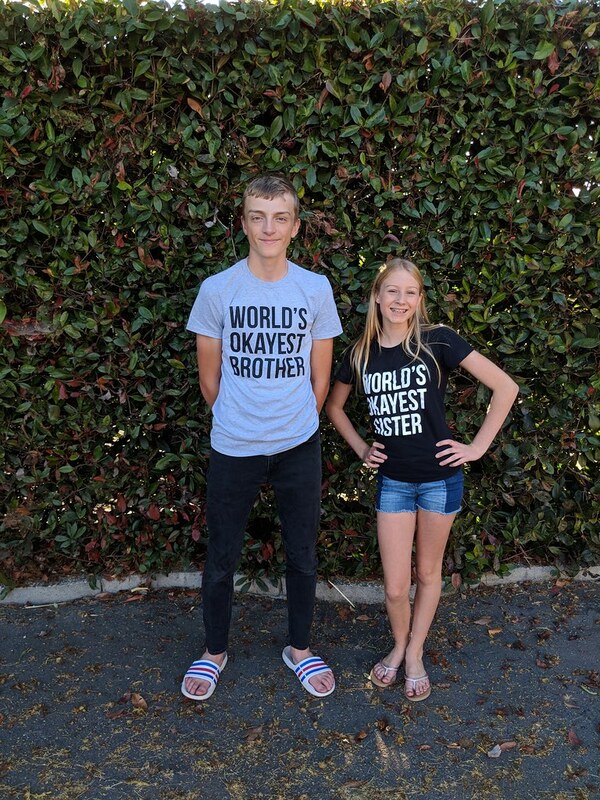 Porter yesterday with his sister sporting their World’s Okayest siblings shirts. Growing up fast! Happy Birthday, Porter. Ohmygosh. Look at him! And he was just a little guy when I met you, Jay. Give him a b-day hug from this total stranger. Happy birthday, Porter. Tell your dad you are old enough for your own website. If you’ve not done so already, he needs a porterhouse steak for a birthday dinner (assuming he’s into beef) – but good luck finding one for a reasonable price! Has he had that porterhouse steak yet (see my post from 3 yrs ago)?